From Vendor Bribes: “Re: Amazing bribery to EMR buyers via HIMSS.” The HIMSS Takin’ HIT To the Streets campaign (gag, even for Doobie Brothers fans) leaps that last boundary of member organization common sense — they’re paying people to attend the sales presentations of their vendor members. I’ve been watching the remake of the old miniseries V and I think maybe vendor visitors have taken over Steve Lieber’s body since the previously furtive and tentative vendor-HIMSS gropefest has advanced to a full-on public consummation. From Dr. Know: “Re: HIMSS. I think that HIMSS needs a shock to the system. We all recognize their priority is to serve the interests of the vendors and not hospital end users. Therefore, I wonder whether an organized boycott of this year’s conference is in order?” I’m not a fan of boycotts. If members and attendees don’t like how they are being represented, they know their options. Without providers as attendees and members, the vendors would bail quickly. From Ryan: “Re: HIMSS. Not sure why Siemens would pull out of HIMSS 2010 in Atlanta, as they have an office in Alpharetta.” They still would have to buy horrendously expensive exhibit space, pay people to work the show, pay union carpet sweepers and power strip deliverers, and bring in people from places a lot further away than Alpharetta. All to reach the mostly non-decision makers (competitors, consultants, and people who don’t influence hospital IT purchases) who pad out the otherwise impressive attendance numbers. Siemens did it before (as SMS) and this time around, Cerner can’t shame them to prospects since they’re not coming either. From Hockey Dad: “Re: EMR ratings. 2,556 primary care physicians (family doctors) rate their EMRs. Results published in Family Practice Management from AAFP.” You have to subscribe to read, but Hockey Dad sent a PDF. The article admitted some unavoidable bias (self-selected respondents, too many vendors to ensure adequate sample sizes for all, and different levels of expectation based on practice size) and accordingly warned about taking the results as anything significant. They didn’t really name overall winners, but the closest thing to it placed the top 10 as (1) e-MDs, (2) MEDENT, (3) Praxis, (4) Amazing Charts, (5) eClinical Works, (6) Epic, (7) Practice Partner, (8) Allscripts Professional, (9) Centricity, and (10) Aprima. From Demetri Noh: “Re: survey. Got this survey, which appears to be from a rival group of HIMSS.” Or “HIMMS”, if you like their version. It’s not clear who funded the research firm’s survey. It’s a great time to be starting up a HIMSS alternative, if you ask me, although I don’t know if that’s the point of the survey. From Billy Bong: “Re: radiologist. This can’t be good for the industry.” An Atlanta doctor who runs a radiologist coverage service faces 20 years in jail, charged with letting unlicensed employees write up his interpretation reports for images he didn’t bother to look at. Listening: Amorphis, another of those Finnish progressive metal bands that I like. 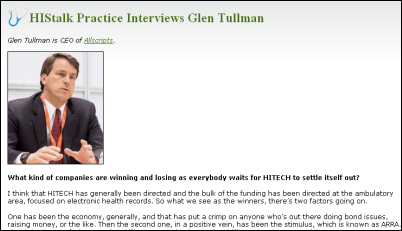 I interviewed Allscripts CEO Glen Tullman on HIStalk Practice. If you decide to check it out, drop your e-mail address in the Get Instant Updates box on that page and you’ll be the first to know when we run something new there (it’s a separate e-mail list since not everybody who reads HIStalk follows physician practice software). Cris Assif is named managing partner of consulting firm Entrust Healthcare. A reader forwarded an e-mail from Duncan James, president and CEO of QuadraMed, welcoming Michael Jarrett as the new VP of client services, coming over from McKesson but also sporting QCPR experience from its previous owners Per-Se and Misys. Linda Baum and Linda Benson were wished well in future endeavors required to take place elsewhere. I can’t find any updates on Charlie McCall’s trial. If you’re in San Francisco, you could wait outside the court house and snap a picture for me, and maybe thrust a recorder in his direction while asking accusatory questions that might startle him enough to answer. EDIMS, the Livingston, NJ based vendor of emergency department systems, is supporting HIStalk as a Platinum Sponsor, so thanks to the folks there. Its EDIMS flagship product is live at 39 sites, has documented over 12 million encounters, and is used by EDs that document 100% of their patients compared to a national average of 40%. It offers a quick registration kiosk, nursing documentation, graphical patient tracking, an alert-driven nursing dashboard, CPOE, order sets, charge capture, prescription writer, medication reconciliation, and lots of other features. I appreciate their support. McKesson announces Horizon Connect, an interoperability product. For home buzzword-counters, the press release included these: solution suite, seamlessly, discrete, actionable, workflow, collaboration, continuity, aligned, continuum, and ubiquity. Epic Systems is among the financial backers of Porchlight, a Madison prevention and treatment agency for homeless veterans. Iowa State University researchers develop software that converts CT and MRI scans into 3-D representations that can be navigated by joystick, making them useful for doctors for planning surgeries and for teaching. As one said, “2-D is guessing and 3-D is knowing.” The product has been commercialized as a $4,995 PC package that uses Xbox controllers. The above image is a converted cardiac CT.
St. Vincent’s Catholic Medical Center (NY) replaces its PC desktops with a virtual desktop infrastructure, speeding up their network since the zero client cubes do screen scrapes of VMware server-hosted applications. The 3x3x2 inch Pano Logic devices have USB plugs that connect to a virtualized Windows desktop server in the data center — no moving parts, minimal energy consumption, and minimal footprint. Sam Heard, the doctor who runs Ocean Informatics in Australia, is profiled in a newspaper article. His company developed openEHR, a “shareable EHR” chosen by Sweden as the basis of its national eHealth infrastructure. Its template designer is pictured above. The nursing school at Case Western Reserve University gets a $1.3 million grant to develop avatar-based software that teaches patients to communicate with their doctors. They envision it running on a kiosk outside the doctor’s office to coach patients on what to ask. A critical results related lawsuit verdict: the doctor of a hospitalized 18-year-old woman who had just given birth orders blood tests, which showed a serious infection. The hospital lab didn’t get the results to the doctor in time to avoid a complete abdominal hysterectomy. The jury returns a $2.3 million verdict against the hospital. Design Clinicals reports that it’s on track to double its revenue and product sites for FY09. Its MedsTracker medication reconciliation product is now live or in implementation mode at 18 sites. Mr. H interviewed founder Dewey Howell a couple years back when the company was in the midst of its first installation. Hewlett-Packard agrees to pay $2.7 billion to acquire 3Com. The acquisition strengthens HP’s position as a one-stop shop for corporate customers. Trinity Health plans to install seven of Elsevier’s online clinical decision support solutions across several of its facilities. Picis recognizes winners of the Picis 2009 Customer Recognition Awards, selected based on their use of Picis solutions to improve their financial and clinical operations in the ED, OR, or ICU. Allscripts contracts with DecisionOne to provide hardware infrastructure support to its clients. Allscripts internal hardware service personnel will integrate with DecisionOne’s field service organization. Sounds like a good move as it allows Allscripts to focus on the software side of the business. Having an internal field service team is less critical in today’s server/PC world than it was in the good old days of proprietary hardware. HIMSS announces it will head to Sin City for the 2012 Conference and Exhibition. According to the Chicago paper, HIMSS chose Las Vegas over the Windy City because of the high cost of labor at McCormick Center, with electrical service at this year’s conference costing 4-10 times as much as it did in Orlando the year before. I love Chicago, but like the Vegas choice simply because the average February temperature is about sixteen degrees higher. Iowa Health System deploys McKesson’s Horizon Medical PACS solution at 34 locations throughout Iowa. Healthvision calls its third quarter “healthy” based on its closing of 97 transactions, including 13 new customer engagements. Intel’s Digital Health Group introduces a mobile handheld device designed to assist people with dyslexia or vision problems. The Intel Reader uses a camera to capture text and converts it to digital text. The device then reads the text aloud. List price: $1,499. API Healthcare signs an agreement with Logicalis to offer remote hosting services to API clients. Premier Purchasing Partners awards Meta Health Technology a 36-month contract to provide Premier members special pricing and terms for Meta’s patient chart abstracting and Electronic Physician query software products. 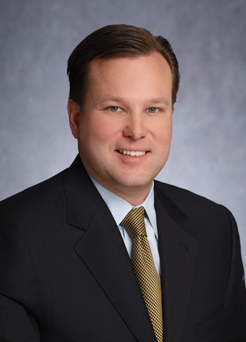 Scott A. Storrer takes over as president and CEO at MEDecision. The transition has been in the works since Storrer joined the company in 2008. Founder and current CEO David St. Clair will retire December 31, but stay on the board for one more year. First Citizens Bank agrees to market mPay Gateway’s patient payment system to its physician practice clients. Indian police arrest the head of an outsourcing company for allegedly selling the medical records data of patients treated in a British hospital. An undercover investigation revealed Vikas Dhairyashil Bansode had thousands of records that included confidential clinical and financial information. Bansode and his accomplices obtained the records from IT companies contracted to convert the paper records to digital. The group then sold individual records to middlemen for as little as $6 each via Internet chat rooms. Senator John Kerry introduces legislation to help small medical practices become eligible for SBA loans to cover EMRs and e-prescribing costs. Funds could be used for both hardware and software. A whopping 94% of healthcare organizations don’t think they are ready to comply with the privacy and security provisions included in the HITECH Act. The new regulations, which go into effect in February, extend existing HIPAA rules including increased enforcement, penalties, and audits. Funding is the biggest barrier. The University of Colorado Hospital signs a contract for multiple Lawson enterprise applications to enhance HR and overall business operations. Healthwise, a non-profit provider of consumer health information content, lays off over 10% of it 222 employees. It has traditionally provided printed materials, but the market is shifting to electronic sources. Healthwise is now focused on providing content via EMRs. Amen, HIMSS has long outlived its usefulness and has been to perverted by other interests. Let’s all save our money and go to the CES show in Vegas where real innovation happens and I hear another great show takes place during the same time! HIMSS is a great resource to gather information to share with your internal peers. Selling the ‘transformation’. I have found great use of the tool kits and education sessions for our Executive Team. Our organization is fairly immature in ways of governance, and clinical transformation many of my peer VP’s don’t see the need to create the structure. HIMSS is useful marketing material to sell the IT Projects…or as I like to call them, Business Transformation Projects most of which seem to be clinical of nature these days. Most vendors miss the education side of HIMSS. It is actually a great place to take your team and key stake holders to help them take ownership. For hospital executives, it can be informative and useful in ways that the exhibit hall could never understand. At least that is my experience. Having said this…personally I would rather attend CES because that is just a lot sexier than HIMSS. Now that is not very becoming for a not for profit educational institute, is it? The Feds should be all over the hard drives of Lieber, Leavitt, and their masterminds. 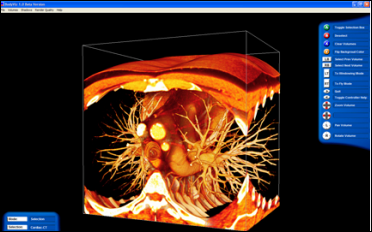 I find it amazing that we have technology available that can show us our insides in 3D and uses an Xbox controller to navigate – yet hospitals still have problems ensuring that critical applications are accessible in a timely manner??? Re:HIMSS – Vegas is a much better choice then Chicago – really who thought it was a good idea to go to Chicago in early April? @@@The nursing school at Case Western Reserve University gets a $1.3 million grant to develop avatar-based software that teaches patients to communicate with their doctors. They envision it running on a kiosk outside the doctor’s office to coach patients on what to ask. Such a grant would be better spent purchasing medications for the indigent or teaching kids to read. The target audience may not know how to work the machine. Amazing. 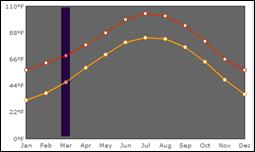 Re: HIMSS – I have heard from several smaller vendors too, saying that more niche driven conferences lead to more sales leads, and have caused them to drop the HIMSS commitment. Given these tough economic times, can one blame them? A shout out to my bud Chris Assif. Way to go dude! B Dub – Hey don’t dis my home town. Snow in April was freak weather for Chicago! Buzzwords aside, it is refreshing to see a huge vendor like McK willing to connect with everyone. Seemed like a drop in HP’s bucket so I clicked the hyperlink…the deal was 2.7 Billion.